The overall population of children ages 0-5 is projected to decline in Orange County, falling 19 percent between 2018 and 2060. 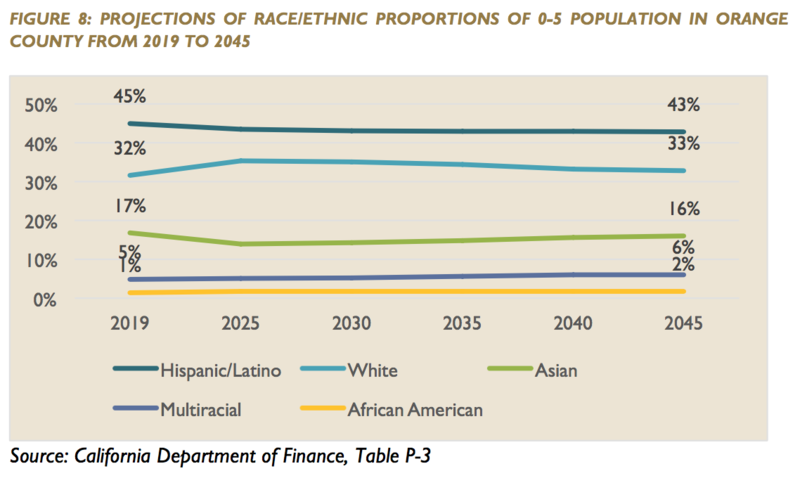 Meanwhile, the historic increase in racial and ethnic diversity is projected to stabilize. Latino children comprise the largest proportion of children from birth through age five (47 percent), followed by White, Non-Hispanic children (19 percent) and Asian/Pacific Islander children (11 percent). Six percent of children are multi-racial or some other race or ethnicity, while two percent of children birth through age five are African American/Black and two percent are Native American. These proportions are similar to projected proportions in 2045. 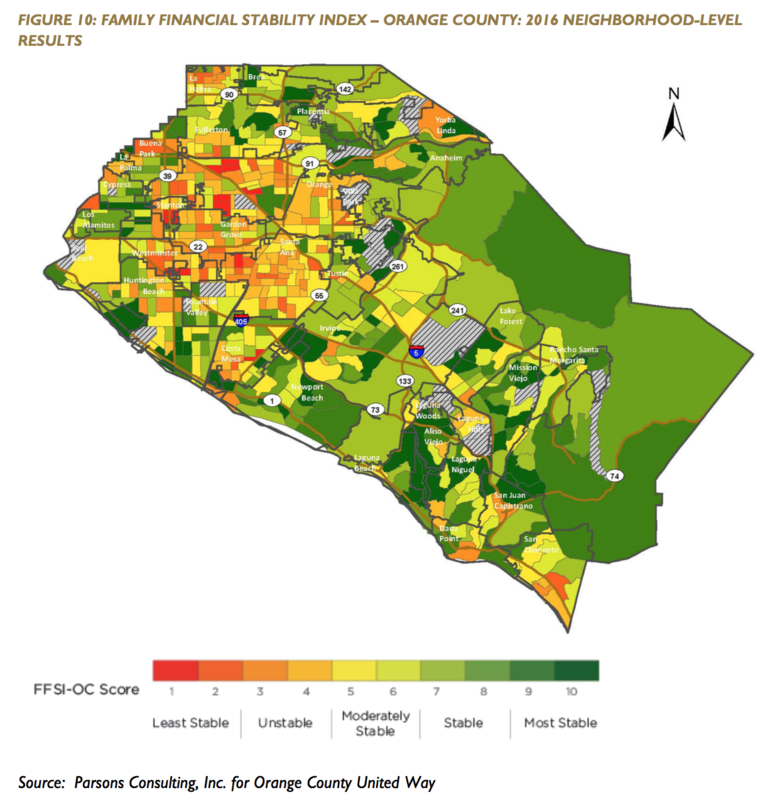 In 2016, Family Financial Stability Index for Orange County (FFSI-OC) reveals that 30% of neighborhoods had low levels of family financial stability (scores of 1, 2, 3, and 4). The FFSI- OC measures the financial stability of families with children under 18 by Orange County neighborhood and is a composite of three metrics: family income, employment status, and amount of household income spent on rent. 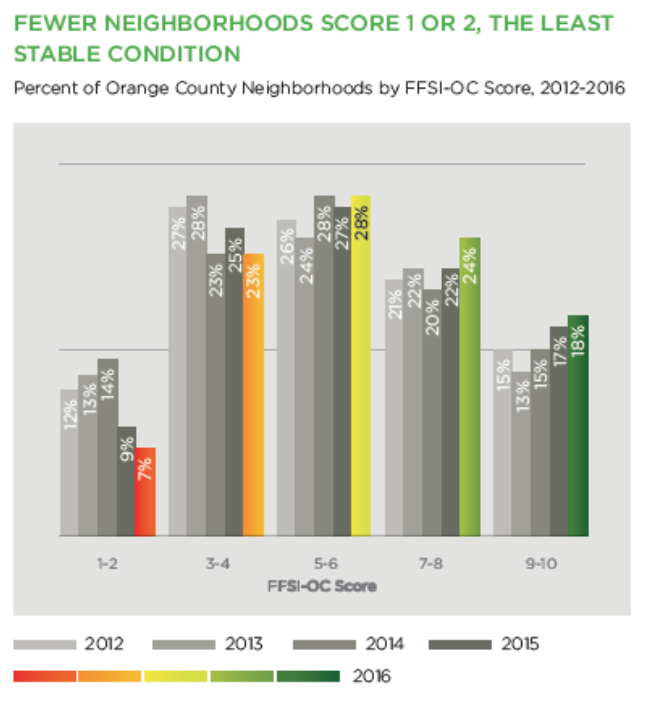 The 2016 FFSI-OC score of 30% is an improvement since tracking began in 2012, when 39% of neighborhoods were unstable, compared to 41% in 2013, 37% in 2014, and 34% in 2015. The improvement in financial stability is driven by increasing employment among families, while the FFSI-OC sub-scores in income and rent burden have not shown any lasting improvement over the past five years. 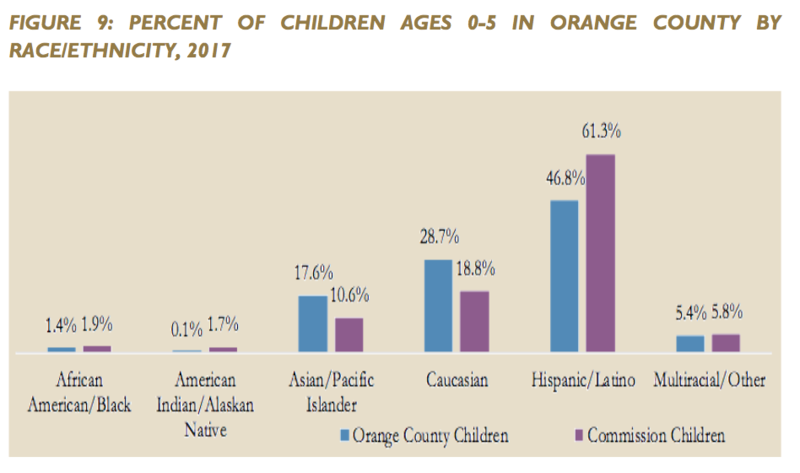 In Orange County, seven (7) percent of families with children under age five were in poverty and 18 percent of families with children under age five and children ages five to 17. The poverty rate for young families jumps up to 25 percent for households lead by a female with no partner present. For single mother-headed families with older children as well, the rate nearly doubles, to 47 percent. For context, the Federal Poverty Level for a family of four in 2018 was approximately $25, 100. Family homelessness is difficult to track. Unsheltered homeless families typically do not congregate with other homeless populations, their homelessness is often episodic and cyclical, and they may actively hide from counts because of an unwarranted fear that their children will be taken away. 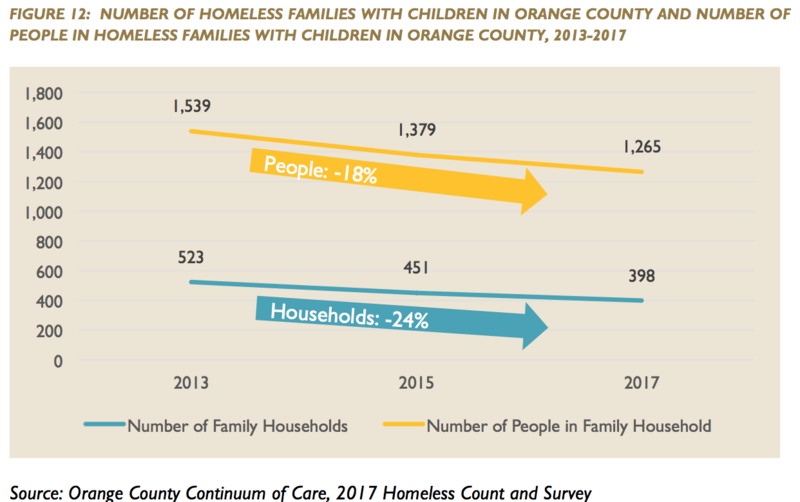 However, the Homeless Families Count conducted over a three-day period in 2017 by a consortium of public and private Orange County agencies, helped 131 homeless families connect with housing and helped another 36 families at-risk of homelessness prevent homelessness. The Family Solutions Collaborative reports that, on average, between 40 and 50 new families enter the Coordinated Entry System each month. 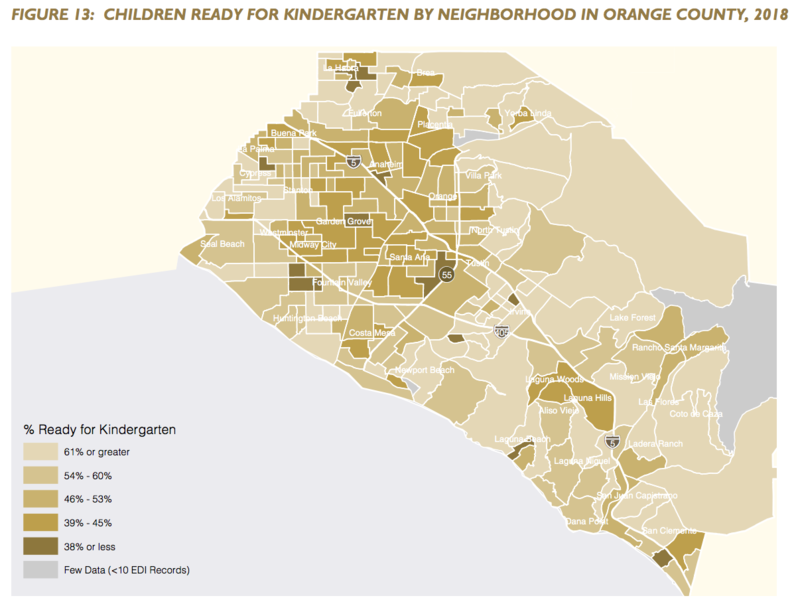 Overall, 53.2 percent of Orange County children entered kindergarten in 2018 developmentally ready to learn. This marks an increase from 2015, when 51.9 percent of children were ready. Results vary considerably by neighborhood from 81 percent ready in Dove Canyon/Coto de Caza to 25 percent ready in the Cypress/Sonora neighborhood of La Habra. There is also variability by race or ethnicity and family income status, but less so than by neighborhood. Asian/Pacific Islander children are the most likely to enter kindergarten ready to learn (65 percent), followed by White, Non-Hispanic children (61 percent). Hispanic children were least likely to be developmentally ready for school (45 percent). Children from low-income families (defined as families eligible for and enrolled in the Free or Reduced-Price Meals program) were less likely to be ready than their non-low- income peers (42 percent vs. 62 percent). The EDI tracks a child’s readiness in five developmental areas. Within these areas, children are most ready in gross and fine motor skills (52 percent) and overall social competence (47 percent). They are least ready in their communication skills and general knowledge (41 percent ready) and prosocial and helping behavior (42 percent ready). Over the past five years, there has been a decrease of 10 percent in the rate of substantiated child abuse and neglect allegations among children under the age of six in Orange County. 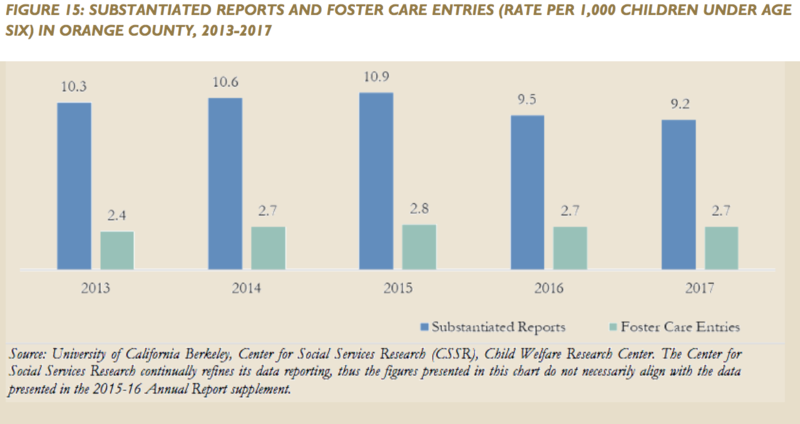 At the same time, entry to foster care among children ages 0-5 has remained steady over the past few years. In 2018, an estimated 33% of kindergartners may have had an unidentified delay. The percentage reflects the proportion of kindergartners whose teacher thought the child had a developmental delay or special need, but the child did not have an IEP (was not receiving special education services). This measure allows us to assess how well we, as a county, are doing identifying children with developmental needs at an early age. 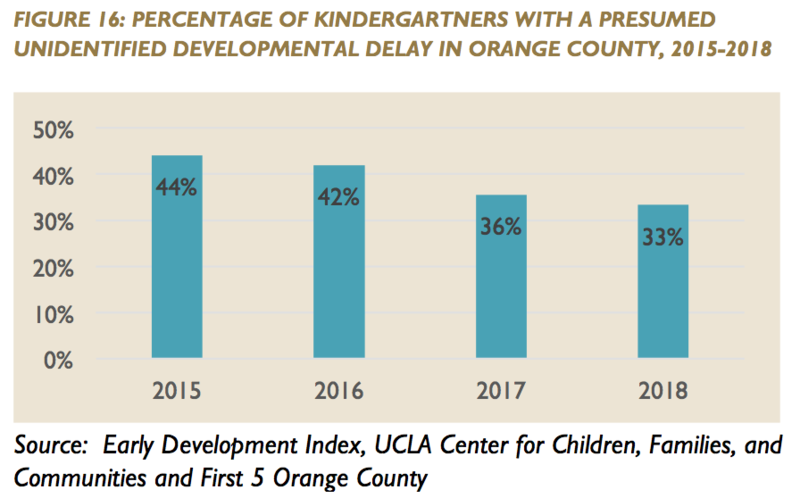 The declining percentage of kindergartners with unidentified delay witnessed between 2015 and 2018, and the steady percentage of children whose teacher believes they have a special need, suggests that the Orange County early childhood system has improved its ability to identify and serve children with developmental delays. 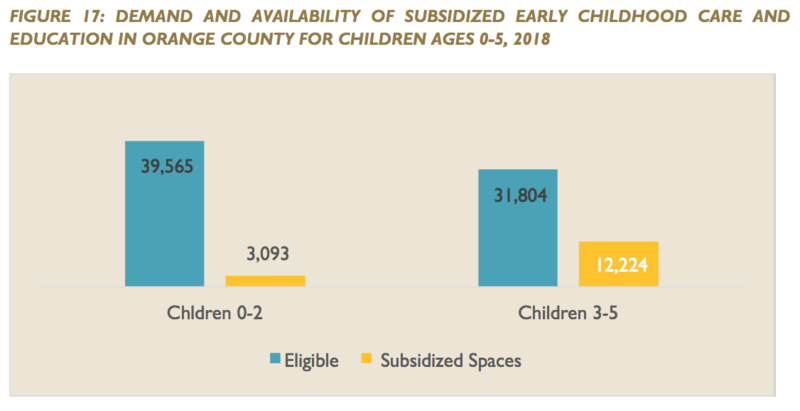 Orange County experiences a challenge in the availability of subsidized child care vouchers and space for children ages 0-5 years. This is particularly evident for infants and toddlers ages 0-2 years. The supply of subsidized care for children 0-2 years falls significantly short, with 36,472 infants and toddlers unserved relative to those eligible. In addition, 19,580 preschool children remain unserved compared to the need for subsidized care. The number of Orange County ECE providers participating in Quality Start OC Quality Rating Improvement System (QRIS) is increasing; however, there are still many providers that are not participating, and therefore, not rated or receiving the professional development, training, and supports the program provides to improve quality.